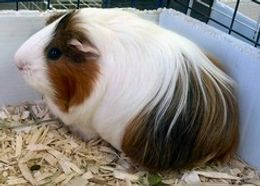 If you’re in the Dallas-Fort Worth area, visit the rescue for high-quality guinea pig supplies at significant discounts, including hay, pellets, Vitamin C tablets and proper bedding. Email us for more information or to be sure we’ll have the supplies you want when you come. 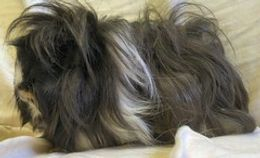 Guinea pigs can die from Gut Stasis if they go more than 12 hours without eating. Guinea pigs eat on-and-off all day and night, and should have food available to them around-the-clock. 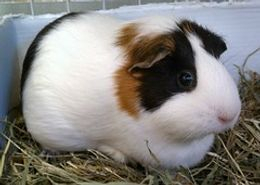 Hay should make up 80% of a guinea pig's diet and should be available to them at all times. Quality Timothy Hay or Orchard Grass should be fed to all guinea pigs over six months of age. Alfalfa Hay may be given to babies under six months old and nursing mothers due to its higher calcium content, but too much calcium after a guinea pig is six months old can be harmful, causing bladder sludge among other problems. If you are unsure of your guinea pig’s age, feed Timothy Hay or Orchard Grass only. 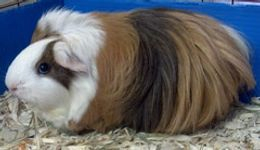 Quality Timothy Hay-based pellets (such as Oxbow's Adult Guinea Pig Food) should be available round-the-clock to guinea pigs over six months old. Alfalfa-based pellets may be given to babies under six months and nursing mothers due to its higher calcium content, but too much calcium after a guinea pig is six months old can be HARMFUL, causing bladder sludge among other problems. If you are unsure of your guinea pig’s age, feed Timothy Hay-based pellets. CAUTION: NEVER FEED PELLETS CONTAINING SEEDS, such as sunflower seeds, as this can be a choking hazard. There’s nothing quite like the sheer joy you’ll see on your guinea pig’s face when you bring them their daily fresh, raw veggies. Do not feed too many fruits that are high in sugar. They seem to like veggies the most anyway! In the morning, feed one-fourth Roma tomato wedge and one baby carrot per guinea pig. In the evening - approximately 12 hours after your first feeding – feed a mix of about three veggies. 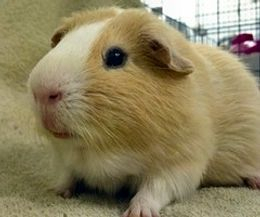 Potatoes, garlic, onions, rhubarb and apple seeds are all POISONOUS to guinea pigs. Tomatoes are ok, but the leaves, stalks and roots of the tomato plant are poisonous. 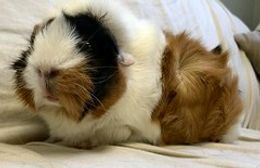 For more information regarding safe vegetable choices for Guinea Pigs, please see our Guinea Pig Feeding Guide which includes information regarding poisonous vegetables. Some favorites we’ve found include Romaine or Spring Mix lettuces, parsley, cilantro, green or red sweet pepper (not the hot, spicy peppers), cantaloupe, watermelon, cucumber, or collard greens. A note about Vitamin C - Select vegetables that are high in vitamin C, as guinea pigs do not make Vitamin C on their own and need it from an outside food source, just like humans. Healthy piggies need 10 mg / kg of Vitamin C per day, which, if not supplied in their food diet, must be supplemented with crushed vitamin C tablets for animals, sprinkled most easily on the cut side of their morning tomato every other day. Vitamin C added to the water NOT a good source. Always provide your guinea pigs with fresh water in a bottle attached to the side of the cage. Filtered water is best, as it removes any calcium, which can cause bladder sludge. Change the water daily to assure freshness. Be sure to rinse the bottle and the sipper tube out daily, and wash them in the dishwasher once a week to sterilize (you may want to use the air dry setting to avoid melting the bottle).